Are you familiar with TED? It is a nonprofit organization whose motto is “Ideas Worth Spreading”. You can find information from them at http://www.TED.com. What TED does is bring some of the brightest minds around the planet to talk about a wide variety of topics. People speak on such things as solving water crisis problems and helping world hunger. They talk about why our universe is fit for our type of life and how to fix a broken economy. Many of the speakers do an excellent job and are fascinating. I’ll admit that most are a bit out of my league or just don’t pique my interest. However, I ran across one of their videos that surprised me. You can go to TED.com or YouTube and search for “Terry Moore: How to tie your shoes”. In this 3 minute video Terry Moore discusses how to tie shoes the correct way. I’ve been tying my shoes for most of my life and hadn’t realized that there was actually a right and wrong way to tie shoes. It turns out that there is a best way to do this, and most people are close to getting it right but one wrong move has them tying a knot that is weak at best. This is a major cause of shoes randomly becoming untied throughout the day. How do you tie your shoes? The right way or the wrong way? Did you even know there was such a distinction? We tie our shoes day after day, and we teach our kids to tie their shoes the way we tie them so that generation after generation grows up tying their shoes the way it has always been done. Just because it’s always been done that way by your family, however, doesn’t mean it’s the best or right way to do it. The apostle Paul understood this later in life. He had spent his entire life extremely dedicated to the Pharisaical sect of Judaism. He knew the letter of the law and was a “Hebrew of Hebrews”. He did everything right (or so he thought). Not only did he do everything right, but he was evangelistic in trying to get others to change their ways and condemning those who taught the way of Christ. It was on his way to Damascus to righteously persecute more of these heretics in the name of Jehovah when Jesus appeared to Paul (then known as Saul). During that encounter, Paul realized that though he had been convinced that was he was doing was right, and even though he had great zeal for his way of life, he was dead wrong and needed to change. Fortunately for everyone who reads the bible he wasn’t resistant to the vision, and he changed his way of thinking with the help of the Spirit. He went on to write most of the New Testament as we know it and became one of the greatest evangelists for Christ of all time. We wrestle with this same kind of thinking today. So many things are done day and week and year after year because we have always done them that way. We accept things as being scriptural because someone said it is scriptural. We, like sheep, blindly follow the sheep that went before us. Fortunately, for us, there is forgiveness from God. We surely do not have everything right. Look at the way we do things in our churches. Why do we do them that way? Why do our churches today look so unlike the churches in the first century when the apostles were spreading the message for the first time? 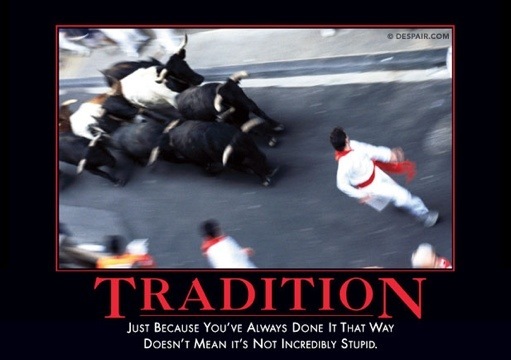 Don’t get me wrong; I am not against tradition. I do, however, think that traditions need to be continually questioned. Is this tradition useful today? What was the purpose for this tradition when it was implemented? Is it right or wrong to participate in this tradition? Then think about what you have been taught. Do I believe that because it is the logical argument passed down through generations, or do I believe it because the scripture actually makes this argument? Is this belief what was handed to me, or is this truth from the word of God? Some things we believe to be scriptural truths aren’t even in the scriptures. According to Deuteronomy 4:2 and Revelation 20:18-19 (symbolic bookends of the scriptures) we are not to hold anyone hostage over anything we have tried to add to the scriptures. We cannot add some tradition then claim it to be heresy if someone doesn’t follow that tradition. We also cannot take the scriptures and cut away the things we don’t believe in. There are at least six different places throughout the scriptures where this warning is given. I encourage you to question things. You were given a mind that has great capacity for logic and reasoning – use it. You fulfill your purpose as you use the talents God has given you, and you were given the ability to think. Don’t simply let someone else do the thinking for you. Just a warning: if you do this, you may come up with conclusions that are different than what your other church members or leadership believes. Be patient. Love and peace and unity are much grander philosophies in the scripture than getting everything right. Romans 15:1 warns us to bear with the failings of the weak. Therefore, it is good to question things and work toward change, but we must be patient with others. God doesn’t just give grace to those whom have all the doctrine right…he gives it to those who haven’t gotten things figured out the way you do too. So, may you learn to tie your shoes properly. May you seek the truth in your beliefs and traditions, but above all, may you seek love and peace and unity among the brotherhood as you work to bring light into error. God bless you, and if there is anything I can help you with in your walk with Christ, please feel free to call me at 245-1611 or email me at jddobbs@verizon.net. If you’d like to see the video I spoke of earlier, you can find the link on my blog at http://www.mrdobbs.org. God bless you, and have a great week!